A new Training programme will start in September 2019, auditions will be held from January till April 2019. The process consists of two phases: a one day pre-selection in different cities and a seven day final audition in Brussels. Welcome to our information page concerning the audition for our upcoming Training programme 2019-2022. P.A.R.T.S. only opens up its Training programme every three years to students between the ages of 18 and 23. 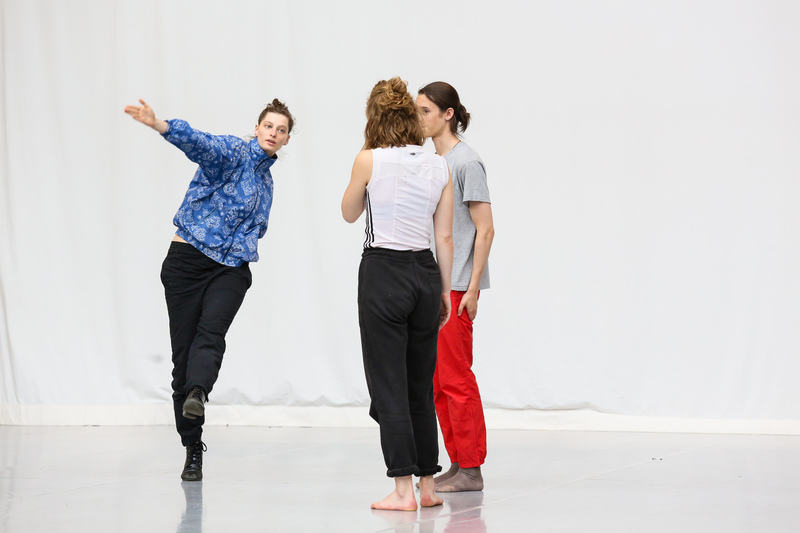 The new Training programme will begin its three-year course in September 2019 for which auditions are organised during the spring of 2019. 1) You must register online for a pre-selection which will take place in various cities across Europe and beyond between January and March. 2) Only candidates who have passed the pre-selection will receive an official invitation with a detailed explanation of the final audition. 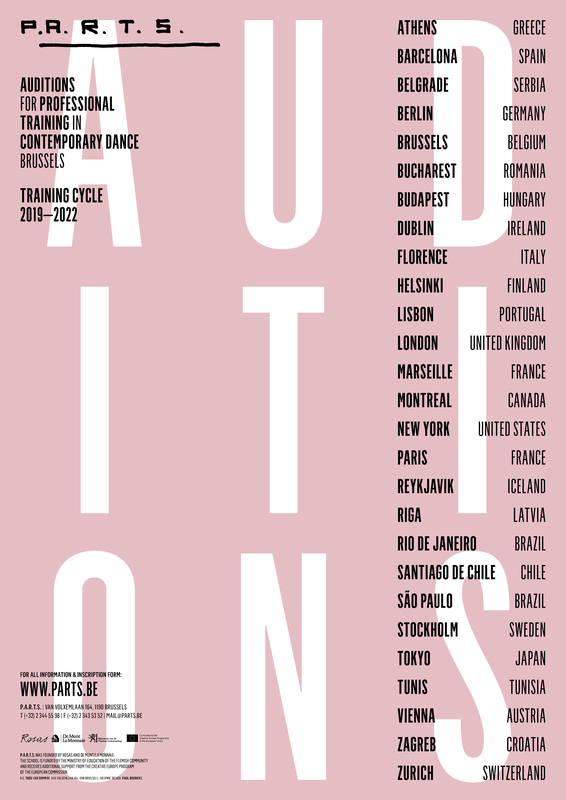 The final audition process takes place in Brussels between April 9 until April 14. The entire full-week participation in this final stage of the audition is necessary to be selected for the Training, so block the dates now! - a minimum level of English proficiency is required (B2 or higher in CEFR scales); this is essential for being an active participant in the programme. You have to register for one, and only one, pre-selection date and location through the following on-line registration form (click to open). Registration ends on Monday at 9AM local time (Central European Time) before the pre-selection you want to attend. You will be asked to pay the registration fee on-line at the end of the registration form to complete the procedure. 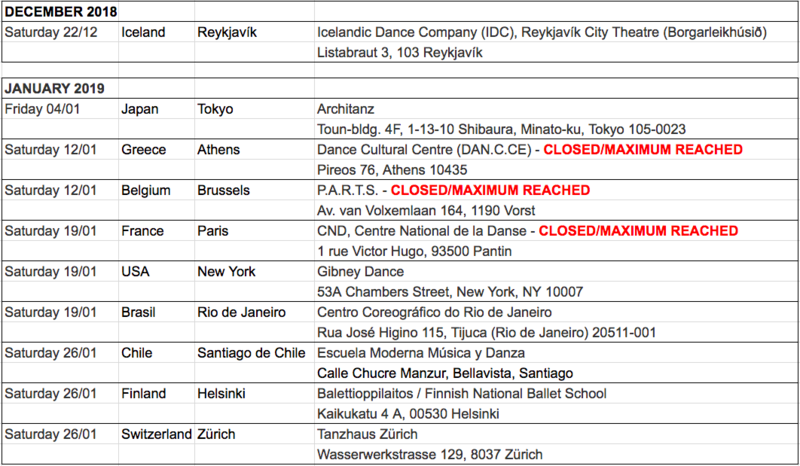 A more in detail overview of the entire audition procedure and entry criteria is available in our FAQ document, which you can find here. For more information on our Training programme, please check our webpage on the Training programme. If you feel you can’t find an appropriate answer to your question, please feel free to send an e-mail to Els De Meyer, responsible for Student Affairs, at auditions@parts.be. We hope to see many of you on one of our pre-selection dates! P.A.R.T.S. opens its doors to the young aspiring dancers and choreographers who are considering participating in the auditions for the Training programe of 2019-2022. The Open Fridays will serve as a chance to take a look at our school and gain insight into the daily work at P.A.R.T.S. The Open Fridays will take place on selected Fridays in October, November, February and March during which we can only allow 5 people per session. If you are interested in participating or would like to have some more information, please click on the following link “Open Fridays”. Students always have the opportunity to showcase their work. The PARTS@WORKS showings are dedicated to giving them a platform. 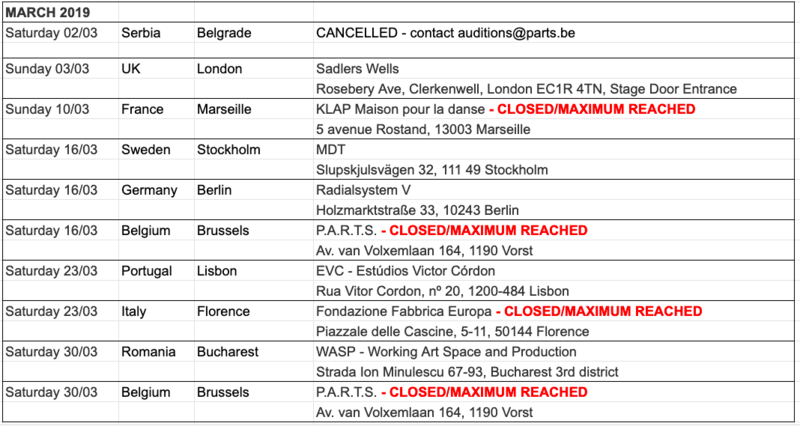 For more information regarding future PARTS@WORK shows, please click here.